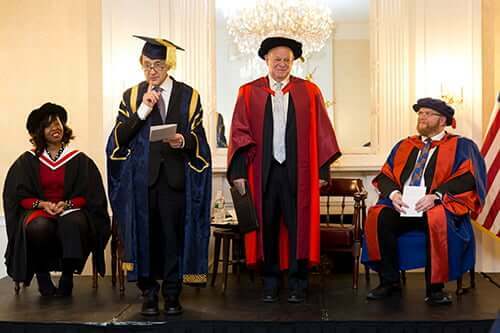 Professor Martin Seligman, who pioneered Positive Psychology, has been made an Honorary Graduate by the University of Buckingham. The ceremony took place in New York, where the American professor lives. Vice-Chancellor Sir Anthony Seldon, Dean of Psychology Dr Alan Martin and a delegation of senior staff were present as well as more than 60 alumni. The Professor works at the University of Pennsylvania as the Zellerbach Family Professor of Psychology and as the director of the Positive Psychology Centre. Professor Seligman’s renowned research includes examining closely the feeling of helplessness and what can be done to change that for a better outcome. He observed that when people feel they have no control over their situation they give up. He has come up with a wide range of suggestions for changing this mindset and came up with the notion of Positive Psychology, which aims to make people and institutions thrive by applying of certain procedures and practices. His research has helped with the prevention and treatment of depression. His profound thinking has also influenced governments as well as university and school teaching. It has found an audience through clinical practice and he has written many books. Giving the citation Dr Alan Martin said: “Professor Seligman’s work has broad reach and has extended into education. Ultimately Professor Seligman understands that if we are to influence the world we must start with the children and young adults who are tomorrow’s decision makers. So it is that Professor Seligman has worked with education institutions worldwide in order to integrate the principles of positive psychology into education. Seligman’s ideas are currently being implemented at the University of Buckingham, which has become the country’s first Positive University. The aim is to make the learning and working environment as conducive as possible to successful and enjoyable study and to make it a constructive place to work.